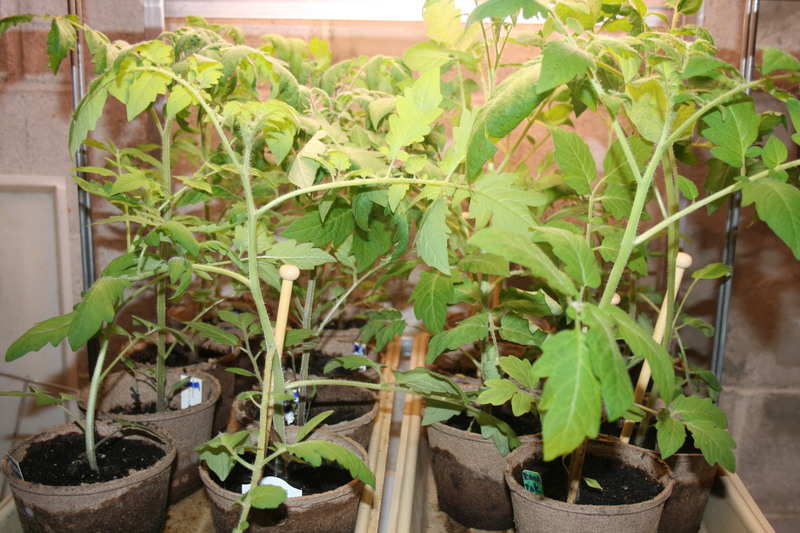 Office full of tomatoes in April! I share a ton of tips for tools, growing and planting in my book and on this blog. In fact, I share ways that can help you drop the cost of gardening down to pennies and, if you save your own seed, down to zero. Today, I want to share 2 new discoveries I have recently made. You might say I discovered these tools and wrote these tips out of desperation. You see, I am surrounded by rapidly growing seedlings like these tomatoes and I needed to think fast about keeping them healthy! As you know, every year I try a few new seeds in my garden. This year, I went for Brad’s Atomic Grape Tomatoes from Baker Seeds. They were described on Baker Seeds as, “… elongated, large cherries in clusters. 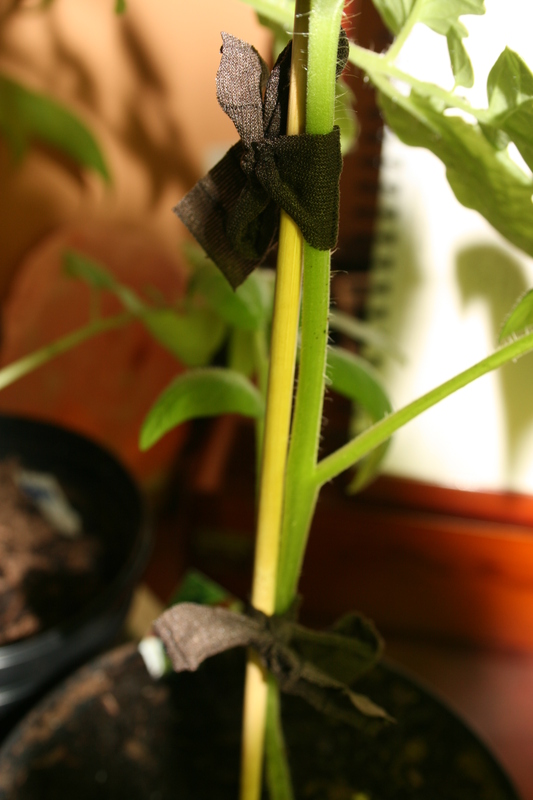 These seeds are vigorous – all of them sprouted…along with the 30 other tomato seeds I planted, a bit too early. Most of them are what is known in tomato land as “indeterminate” i.e. they grow to be 9 to 12 feet high! Last year’s knitting needles don’t cut it. So, today, I am surrounded by 22 tomato plants (and I have 17 more in the basement) that have simply outgrown their 5″ peat pots and my amazing plant stand! And I won’t be able to re-home some of them and transplant the rest for another 4 to 5 weeks. Panic set in…and after a sleepless night or two, I started searching for solutions. Luckily, I found a place to get black plastic nursery pots at a reasonable price. So I picked up some organic potting soil from my local feed store and set about transplanting the biggest tomatoes first. Then I realized I needed to stake these babies, even in their new, 8″ high pots. 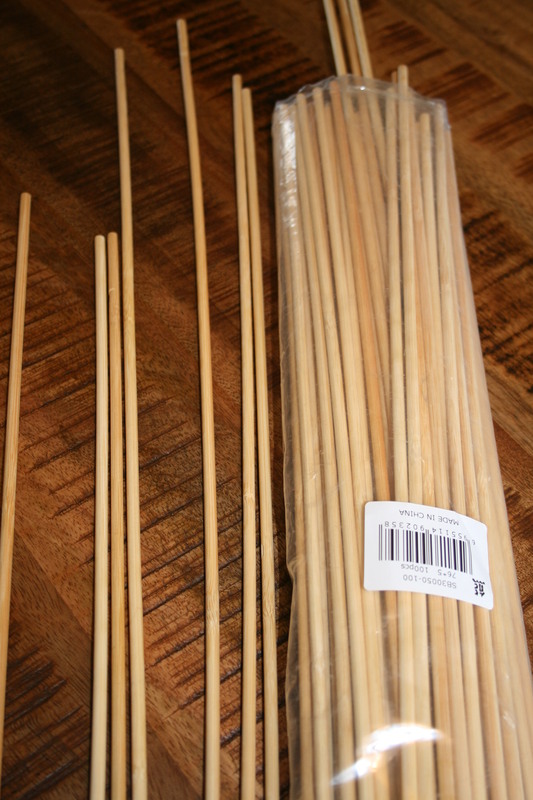 However, the only stakes I could come up with – aka “splits” as they are known in the biz, were bamboo, dyed green and the only quantity for purchase? 1000. That’s not a typo; I could only find them in packs of 1000. I’m 70 years old. The odds of me using 1000 bamboo splits before I…split, are slim to none. So I started to think laterally and guess what? Marshmallow sticks in a bundle. That’s how I found marshmallow sticks. I got one package of 100 sticks, 3/8″ in diameter and 30 inches long on Amazon for chump change. Anyway, pants suits meant dress socks. When I finally retired, for the 3rd time, I donated almost all of my “executive” wardrobe to an agency working with battered women — so-called displaced homemakers. The dynamic duo for tomato staking. 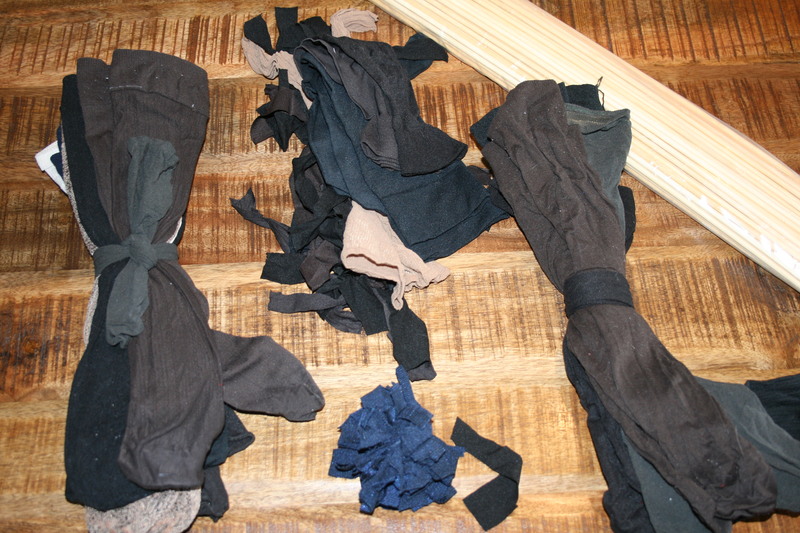 But I forgot about the socks….until I staked my tomatoes. What better way to tie the tomato plants to the marshmallow sticks? 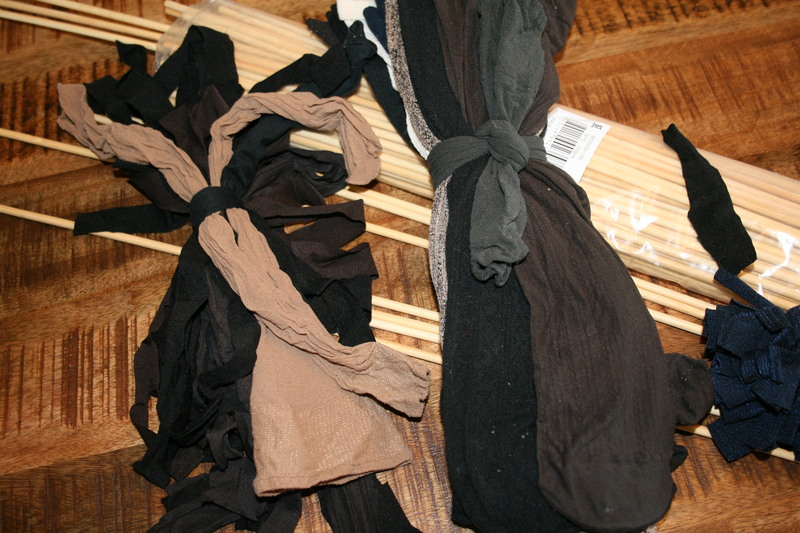 Soft, easy to cut and even easier to tie, my heap of socks began earning their keep again! The short ties are soft and easy to put in place, tenderly holding these baby tomatoes against their marshmallow sticks. I also cut long ties that will be used for these babies once they are trellised in my yard. So, I may not outlive the marshmallow sticks and, considering what the socks are made of, I know I won’t outlive the plant ties but I am truly, deeply grateful for both. 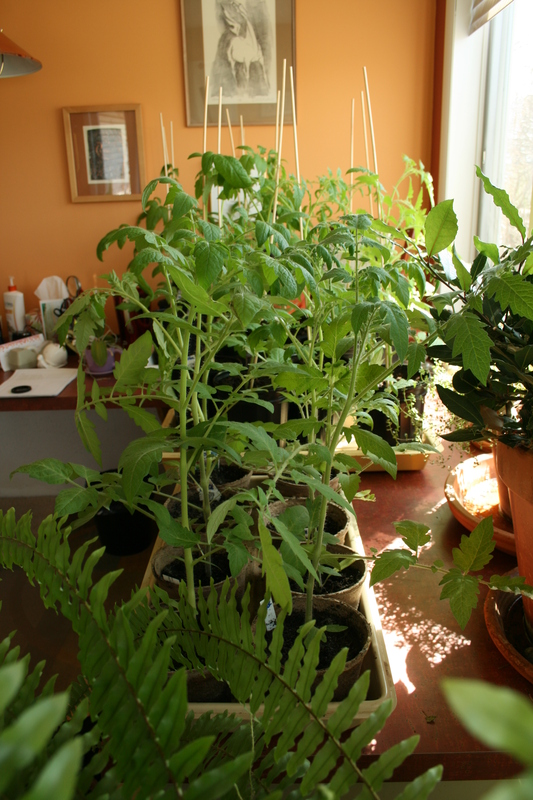 Now I know my beautiful, too tall tomato plants will not just make it to the great outdoors but will thrive there.